FaceGloria: A "sin-free" Facebook for evangelicals in Brazil. 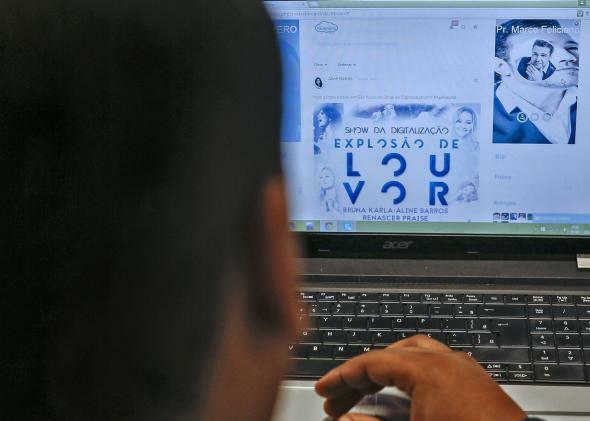 A man uses his profile in the social network for evangelicals FaceGloria, in Sao Paulo on June 29, 2015. We spend about 30 percent of our time online on social media, so it should come as no surprise that religious people want in on the action. Some faithful, like ultra Orthodox Jews, have tried to shun access to the Internet, but others in the Hasidic community realize that it’s the community’s best chance for survival. In Brazil, evangelical Christians are taking it one step further: They’ve started a “sin-free” version of Facebook called FaceGloria. Many other startups have tried to ride the wave of religious social media. Earlier this year I wrote about Parallel Bible, an oddly addictive Instagram-like app that used biblical quotes instead of filters, but it had trouble gaining enough users to make it truly, well, social. When it comes to Facebook-like apps, though, religions have had a lot more luck. Ummaland, the Muslim version of Facebook launched in 2013, was created “on Islamic values, no small talk, no boasting, no gossiping and backbiting but focusing on the message that really matters.” It encourages “every user to ponder upon if the message they share will benefit Ummah or not, if not, it is better to be silent.” There are more than 300,000 users. FaceGloria, which is currently only available in Portuguese, reportedly attracted 100,000 users in its first month. (It may help that Brazil is 22 percent evangelical.) The company started while the three co-founders were working in the office of Acir dos Santos, the mayor of Ferraz de Vasconcelos, who has since invested more than $15,000. As it grows—the founders have bought the FaceGloria domain in English and other languages—the co-founders hope to take on its secular predecessors. Instead of liking something on Facebook, on FaceGloria you click amen. But the biggest difference is what’s forbidden: 600 words to be exact. The same goes for violence and erotica as well as anything having to do with homosexuality. Perhaps the starkest difference between FaceGloria and mainstream networks like Facebook, aside from the self-selective users, is the Brazilian network’s strong stance against homosexuality. In 2011, a National Religious Brodcasters report accused Facebook of limiting religious expression when it removed content it deemed anti-gay. (The report also alleged that Google created obstacles for pro-life groups.) One of FaceGloria’s raisons d’être is to be a setting where everything gay is banned. Sites like FaceGloria and and Ummaland offer a platform for religious groups to grow and communicate in a comfortable setting, which is valuable. But that doesn’t exactly make them sin-free.